Capitol Reef National Park has over a dozen maintained trails, starting either along highway 24 or the park scenic drive, and leading to arches, overlooks of the Fremont River, viewpoints of the reef, or along deep gorges. Opportunities abound for off-trail hiking, principally along the many narrow canyons that run along or through the reef - see the listings of Capitol Reef Slot Canyons. Most of these are quite remote and rarely visited but there are several more popular drainages with recognized routes such as Spring Canyon and Sulphur Creek. The Capitol Reef hiking map indicates the location of each trail. A dozen or more narrow canyons cut through the Waterpocket Fold. Capitol Gorge is the easiest to explore - starting from the southern end of the park scenic drive, a level track winds through the tall sandstone rocks, reaching the far side after about a mile, and also passing a collection of historic pioneer signatures. A 0.2 mile side trail leads to The Tanks, a collection of eroded crevices that collect rainwater. 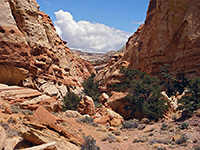 The Capitol Gorge track was for many years the main route through Capitol Reef, until UT 24 was constructed in 1962. Cassidy Arch 1.75 600 The short, moderately steep trail an overlook of Cassidy Arch starts from the end of the track leading to Grand Wash, climbing the Wingate and Kayenta sandstone cliffs then heading back west to the arch. 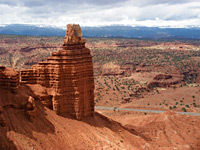 Continuation hikes are possible along the Frying Pan Trail which branches off to the north, over the top of Capitol Reef. The arch is named after Butch Cassidy, who once camped in Grand Wash.
Chimney Rock 3.5 (loop) 580 Beginning near milepost 76 of UT 24, this hike climbs quite steeply up the hills that line the north side of the highway, then loops around the top of Mummy Cliff while passing close to Chimney Rock, a solitary pillar of Moenkopi sandstone. This trail is also used to reach Spring Canyon and then Chimney Rock Canyon, which can be followed for many miles either east or west. Cohab Canyon 1.5 340 Cohab is a short, secluded canyon on the west side of Capitol Reef just south of Fruita on UT 24. The trail to it begins from the national park campground, ascends the cliffs, follows the canyon to the upper end, then descends towards the Fremont River. 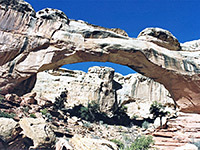 Junctions lead to two viewpoints of the river, and to Cassidy Arch/Grand Wash (via the Frying Pan Trail). Fremont Gorge Overlook 2 1,040 The deepest part of the Fremont River canyon is south of Hwy 24 and west of the reef, where for several miles the canyon walls exceed 1,000 feet in height. The Fremont Gorge Overlook is the more strenuous of two routes to viewpoints of the canyon, starting near Fruita and ending at the edge of a cliff high above the river. Fremont River 1.25 460 This short nature trail follows the Fremont River, beginning at the campground, through level ground with orchards and fields, then climbs quite sharply to an overlook of the western river canyon. Frying Pan 3 800 The Frying Pan trail connects the paths to Cohab Canyon and Cassidy Arch, following near the top of Capitol Reef and involving various climbs and descents over slickrock terraces & ravines. Golden Throne 1.8 700 One of two hikes beginning at the far end of the park scenic drive, this climbs the cliffs on the north side of Capitol Gorge, winding around several side ravines to the top of a dome overlooking the gorge to the south and Golden Throne to the north - a rounded summit nearly 1,000 feet higher. Grand Wash 2.25 200 Grand Wash offers an easy introduction to narrow canyon hiking - the route along the wash is flat and shaded, passing beneath towering sandstone cliffs. 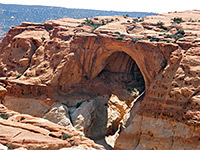 Hickman Bridge 1.2 400 Sandstone arches are found all over Capitol Reef though most are quite inaccessible. Hickman Bridge is one of the few reached by a maintained trail, starting from UT 24 next to the Fremont River. Old Wagon 3.5 (loop) 1,100 The Old Wagon Trail is part of a route once used by pioneers to travel between Capitol Gorge and Grover, on the slopes of Miners Mountain. The hike climbs into wooded hills offering increasingly good views of Capitol Reef and the Waterpocket Fold. Red Canyon 2.7 400 Red Canyon is a short drainage emerging from a wide, cliff-lined amphitheater on the east side of Capitol Reef, reached by Notom-Bullfrog Road. A lightly used trail crosses open land then follows the streambed into the middle of the basin. Rim Overlook/ Navajo Knobs 2.25/4.5 1,550 From the trailhead beside UT 24 (also used to reach Hickman Bridge), the longest maintained trail in the park ascends the hillside above the Fremont River and follows the gorge westwards, reaching a viewpoint on the cliff edge 1,000 feet above Fruita after 2.25 miles. From here the path turns away north, across more high ground to a region of eroded Navajo sandstone and another panoramic overlook of the Fremont River valley. Spring Canyon 4 250 Spring Canyon is a long, deep, twisting ravine that joins the north side of the Fremont River in the middle of Capitol Reef. A hike along the lowest few miles encounters tall cliffs, alcoves, pools and a seasonal stream. Sulphur Creek 5.3 500 Although there is no trail through the deep, watery narrows of Sulphur Creek, the route is well enough known to have an NPS sign at the trailhead, shared with Chimney Rock. The creek emerges beside UT 24 again next to the visitor center, from where the return journey is back along the road, by walking, using a car shuttle or hitching a lift. Sunset Point 0.4 level This short route follows close to the northern rim of the canyon of Sulphur Creek to a small summit with 360° views of cliffs and peaks, a good place for photographing the sunset. Another even shorter path starting from the same point (end of a side road off UT 24, near the western park entrance) leads to an overlook of the Goosenecks of Sulphur Creek. Surprise Canyon 0.9/0.7/0.9 250 One of many short canyons on the east side of the Waterpocket Fold, reached by an easy hike from Notom-Bullfrog Road. This drainage has three forks, all similar in appearance; briefly narrow then quickly gaining height.